An indication by the Director of Public Prosecution Mutembo Nchito that he would personally prosecute former President Rupiah Banda on the graft charge involving vehicles donated by a Chinese company has generated severe controversy. Lawyers representing the former President Banda have indicated that they will object attempts by Nchito to prosecute the former Head of State at the hearing because of conflict of interest. This was after the prosecution team informed the court that Nchito would be part of the prosecution team and was expected to be with the team at the next hearing. On Wednesday night, former president Banda was served court papers in which Fred M’membe, the owner of the Post Newspaper has cited him for slander on account of statements he allegedly made suggesting that Mutembo M’membe had inside track information from Nchito’s office on prosecution matters. M’membe who is represented by Nchito and Nchito stated that the words complained of in their natural and ordinary meaning meant that he was unscrupulous individual who interferes in the manner in which Nchito conducts his works as DPP. Yesterday one of the Lawyers, Stephan Lungu informed court that the defence would object at the next hearing to have DPP Mutembo Nchito himself take conduct of the matter against former President Banda. Lungu said that Nchito was a potential witness in one of the matters against former president Banda and that he could not prosecute the matter. This is in a matter which a Chinese construction company representative together with former President Banda has been charged with corruption and have both denied the charge. Economic Construction group, is accused of giving former President Banda 10 campaign trucks during the 2011 general election. “I understand the charge and I deny this charge,” Gao told magistrate Obister Musukwa. 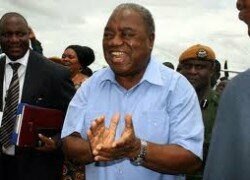 And Former President Rupiah Banda has pleaded not guilty to fresh charges of graft. Former President Banda taking plea before Magistrate Musukwa said that he understood the charge but pleaded not guilty, “I understand the charges my lord and I plead not guilty.” Earlier this year the company vehemently denied ever bribing President Banda. Sogecao Director Li told a press conference that the contract to build the Mwanawasa Stadium was awarded to them by President Levy Mwanawasa and that the donation of the vehicles to Mr. Banda was done long after the Stadium was completed. “We can talk about ourselves frankly and honestly to the Zambian government and people that all the projects awarded to us are by proper means of public bidding… there are no secret acts which are acceptable. Surely it is unnecessary for us to give any so-called “truck gratification” to any individual,” Li said. Hearing for the case has been set for January 21 2014.